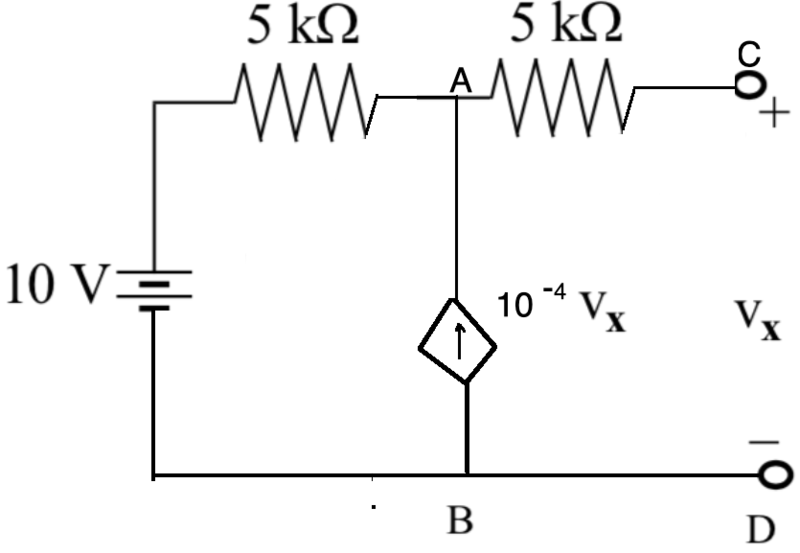 To find the open circuit voltage between C and D, can I assume that no current flows through the current source between A and B. If it does not, the Thevenin voltage is 10V. But since it is not an ideal current source some current should flow through it. Also, to find the short circuit current V_x = 0 (short circuit between C and D). So should the current source be not considered while calculating the short circuit current. If so I will get the short circuit current as 1mA. But this analysis does not seem to be correct because it is independent of the current source. BRODIE is a new contributor to this site. Take care in asking for clarification, commenting, and answering. Check out our Code of Conduct. What is the current flowing through the circuit you are left with ? Can you write a simple KVL equation for the only loop you are left behind with ? You will reach the answer. Not the answer you're looking for? Browse other questions tagged circuit-analysis current-source thevenin or ask your own question.